All homes currently listed for sale in the zip code 92620 as of 04/21/2019 are shown below. You can change the search criteria at any time by pressing the 'Change Search' button below. "This beautiful property is located in the prestigious gated community of Rosegate. Built by Taylor Woodrow, this small, cozy community is nestled within Citrus Glen Park, and backs into to Hicks Canyon Trail. The open floor plan with soaring ceilings invites you to a large formal living room with a warm fireplace. The beautiful, wood-framed bi-fold patio doors turn the backyard and the family room into one, large common space, perfect for parties and entertaining. The formal dining room opens to the quaint courtyard. The master suite overlooks the hiking trail, and the lush, private backyard has fully developed, mature landscaping. The motorized retractable patio awning allows you to precisely control the amount of sun, when hosting a backyard barbecue. This home was completely remodeled in 2015,all with the proper permits. The kitchen was remodeled to meet the needs of even the most demanding chefs. The stove was fitted with a powerful range hood to carry away smoke from high temperature cooking. Above the granite counter tops are custom cabinets, and the center island offers a centerpiece for a social gathering. A breakfast nook provides a comforting place to enjoy a lazy, Sunday brunch. The wood floor and stair rails have been stained and finished to a rich, brown hue. The master bedroom was updated to a more modern style. Furthermore, the remodeled master bathroom boasts custom cabinets and all new fixtures." "HUGE PRICE REDUCTION! Rarely available floor plan from Taylor Woodrow Homes in the exclusive community of Rosegate of Northwood Pointe. This elegant and unique home features designer touches with a soaring 20ft+ grand foyer ceiling that extends into the dramatic formal living & dining areas. Behind it is a gourmet entertainer s kitchen equipped with a 6-burner Viking stove, double ovens, wine fridge, Sub-Zero refrigerator, high-end cabinetry, a large center island and a quaint breakfast nook. The main floor boasts an office space and bedroom with patio access from the bath. A 3-car garage with epoxy flooring rounds out the downstairs and is equipped with a temperature controlled 1200+ wine bottle cellar. Ascend to the spacious master suite using the tasteful front or private back staircases and unwind in this retreat-inspired bedroom with designer built-ins. A loft/study area and 4 additional en-suite bedrooms complete the upstairs. Flooring consists of 16 marble tile in the entry, library, living room, dining room and kitchen. Rich mahogany wood floors expand throughout the family room and downstairs bedroom while plush carpeting covers the rest. The family room opens to the expansive back yard, drawing attention to the charming gazebo, built in BBQ island & stone tile, ideal for entertaining. 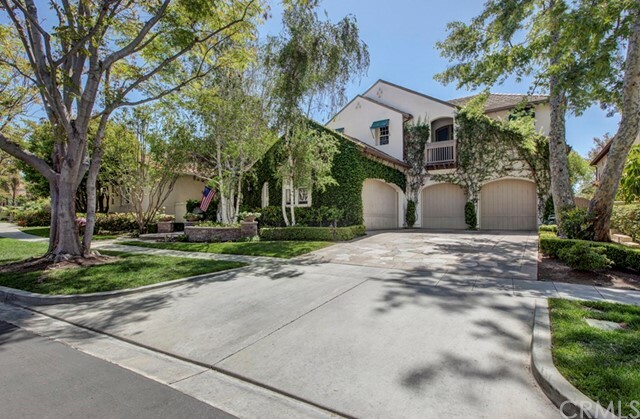 In addition to being walking distance to the Blue Ribbon schools of Canyon View Elementary and Northwood High School, residents enjoy access to parks, trails, pools and sport courts." 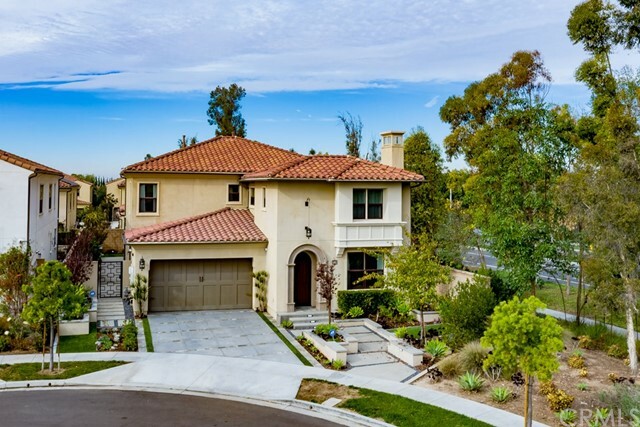 "Situated in the prestigious and coveted Rosegate community, this stunning Santa Barbara styled Taylor Woodrow built residence is sited on what could be considered one of the premier lots with its private corner lot location. Tucked behind the long driveway, and through the inspiring front entry courtyard lies this perfect blend of design and architecture. A fascinating layout with varying sets of French doors that open up to the exterior courtyard and patio spaces. Upon entry, the formal living and dining rooms offer a soaring two story vaulted ceiling with catwalk and upper lever bookcases, exuding that feeling of opulent elegance. The gourmet kitchen is adorned with rich wood cabinetry and professional grade appliances and hosts a separate eating nook and pass-through butler pantry. A main level study with built-ins and intricate woodwork opens up to the entry courtyard. The upper level includes three spacious bedroom quarters that accompany an oversized master suite with lounge area and stately master bath with soaking tub, dual sinks, vanity area and walk-in shower. The private rear terrace is a tranquil place to enjoy al fresco dining and entertaining. A four car garage is flanked by an oversized auto court for additional parking. Tremendous opportunity for a special property nestled within Citrus Glen Park and offering close proximity to various trails and award winning schools." "Exquisite,highly upgraded Rosegate Estate home features 5 beds (one down),2 home offices(one up,one down),5.5bath,library with built in book case & wine room! Fully hardscaped entertainer's backyard backing to Hicks Canyon hiking trail with maximum privacy. Pebbletech Pool & spa,custom fireplace & built in BBQ! Incredible kitchen features handmade tile counters,upgraded cabinetry & Granite top center island. Designer upgrades include Limestone, Hardwood floorings, custom wood work in both offices, Wrought iron staircase and more! Just amazingly beautiful home! Award winning top schools (Canyon View elementary, Sierra Vista Jr.high, Northwood high) and easy access to shopping & freeways." "This luxury home is the largest model single family home in Acadia at Stonegate which features rare 5 bedroom suites including two suites downstairs located in Stonegate Community. The beautiful, stylish kitchen contains built-in fridge and microwave with an oversized island that opens to the great room which has a cozy fireplace. Adjacent to the kitchen is a breakfast area & formal dining area. Upgrades include Solar Panels saving electricity bill, Stainless Steel 6 Burner Gas Cook Top, Dual Ovens, Microwave & Dish Washer and more. Exquisite Master Bedroom suite is truly a sanctuary and an adjacent to luxurious mater bath with Jacuzzi tub, marble shower, and spacious walk-in closet. Other wonderful features to enjoy with this home are walking distance to school, low association dues, community pools, basketball courts and tennis courts. minutes to freeway, shopping and dining." 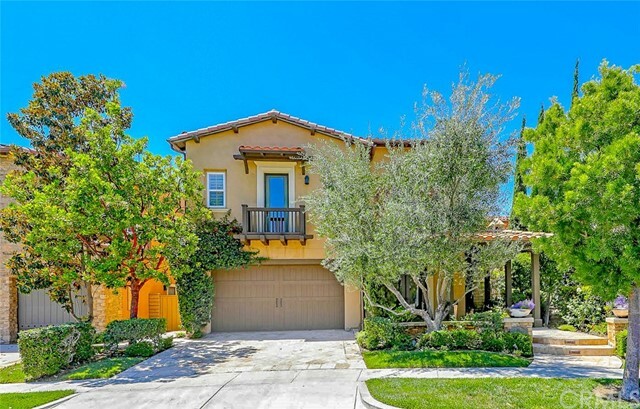 "Situated in the gated community of Arbor Crest in Northwood, this area is part of the master plan of the prestigious Irvine community. This executive home features a lush garden with water fountain in front yard, spa, waterfall and koi pond, built-in BBQ station at the backyard. Bright and airy floor plan, with one bedroom suite on main floor, plus an office/library; 4 spacious bedrooms upstairs. High ceiling at entry, granite counter tops in kitchen, stainless steel appliances in the kitchen. Spacious master suite features walk in closet, plus a den that could be turned into a nursery room, reading area or gym. Close to schools, shopping and fine dining. Move-in condition." 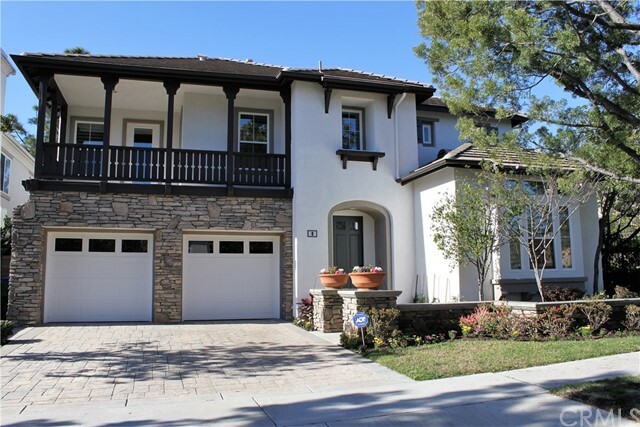 "Captivating Tuscan Juliet's Balcony home located in the heart of Irvine. Tastefull designer reflects high quality appointments. Most desirable floor plan with high ceiling dining room, downstairs bedroom suite plumed for kitchenet and eating area ,or professional office or gym. Upstairs master bedroom plus 3 spacious bedrooms. Elegant interiors: top of the line cr me mafia marble flooring throughout, designer paint/window covering/shutters/Ornamental iron and stain stair case /stereo speakers. Gourmet Kitchen: top selection of counter tops, stainless steel appliances, 8-burner gas cook-top, logia, walk-in closets in all bed rooms. Entertainer's backyard: professionally landscaped. Resort-style Woodbury is the prime location of Irvine: short distance to everywhere, 16 parks, 7 swimming pools, 30-acre sport fields/club, easy access to 40 restaurants and shops, ocean, and Best Irvine schools. The perfect place to live without ever leaving the neighborhood. A great place to call home! Must see!! Seller spent approx. $300k for the upgrades! Per seller. This home was purchased as a second home. Nearly brand new and just like a model home." 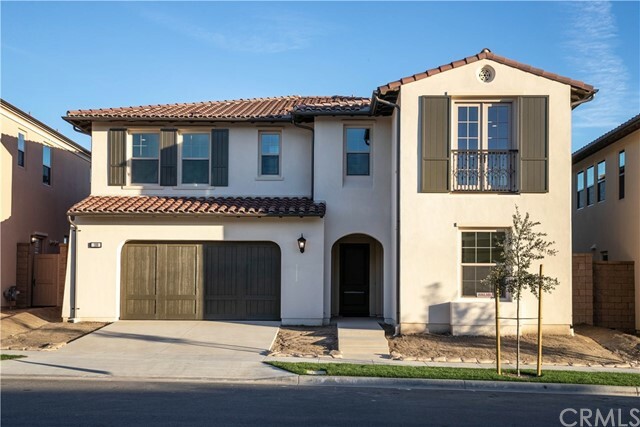 "Located in the sought-after neighborhood of Eastwood Village, this stunning Irvine home is part of the new William Lyon Signature Collection. Truly luxurious, this home boasts striking upgrades and high-end finishes throughout. The grand, two-story foyer w/dramatic overlook leads to the open concept living area. Fluidity of the space promotes ease of living while large windows illuminate the rooms. Gourmet chef s kitchen features upgraded white maple cabinets, stainless-steel KitchenAid appliances, gas 6-burner range, built-in refrigerator and wine fridge in the butler pantry. The elegant formal dining room offers French doors leading out to the patio. Unwind in the adjoining living room with surround sound to watch a favorite show. Also offered is a spacious first floor bedroom & full bath w/a walk-in shower. Upstairs houses 3 additional bedrooms, each with their own baths. Master Suite features 2 walk-in closets w/ built-in organizers, soaking tub, walk-in shower & dual marble vanities. Laundry room is conveniently located on this floor as well as a spacious bonus room. Out back, your oasis awaits. Grill in the built-in BBQ, serve drinks from the bar, try your luck on the putting green or relax around the outdoor fireplace while listening the tranquil sounds of the ripple fountain. 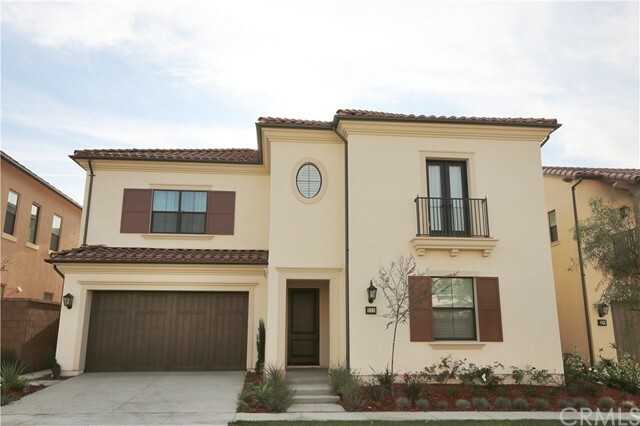 Conveniently situated within walking distance to Irvine's Award Winning Schools, Frontier Park & Hicks/Jeffery Walking Trails." "New Pirce improvement! With $200,000 in upgrades, landscaping and hardscaping, this luxurious estate nestled on a private cul-de-sac & premium-sized lot, has been customized and redesigned with vitality that enthralls & rivals any possible model homes offered by new builders without the extra taxes. Richly designed in sophistication, 30 Shepard boasts soaring ceilings, premier White Porcelain like floors, grand living space with multiple entertaining areas bathed in natural light. An expansive gourmet chef s kitchen remodeled for discerning entertainers with stainless steel appliances, dual sinks, 8-burner cooktop, solid wood shaker cabinetry and timeless finishes of marble, quartz and granite. The upstairs floor plan enjoys an open loft/bonus room and 4 spacious bedrooms each with en suite baths. An opulent and romantic master suite with retreat & redesigned bath, also feature quartz & marble, a luxurious roman spa-jetted tub, expanded shower with customized closet & make this a true restful & rejuvenating space. The main floor offers a private entry to separate guest quarters perfect as a desirable in-law suite. The large private yard offers seamless extension for entertaining with romantic cafe-lit pergolas, inviting fire pit with customized BBQ with elegant bar seating. Woodbury features 7 pools including The Lagoon, 7 parks/gardens, 4 professional tennis courts within 1 mile of world class shopping. Best FENG SHUI in Irvine! South facing yard and north facing door!" 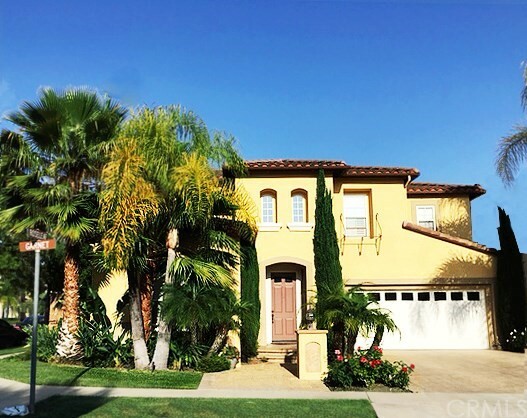 "Welcome to La Cresta in the highly sought after community of Woodbury. This spectacular estate boasts 3,866 sqft of impressive finishes combined with modern upgrades completed by the builder, Brookfield Residential. A well-executed open floor plan located at the end of a cul de sac siding to only one neighbor is a premium find. Equipped with 4 bedrooms (one main floor Jr. Master bedroom) plus a sizable loft paired with a beautiful designer kitchen showcasing Limestone countertops, upgraded glazed chocolate cabinetry, WOLF stainless steel appliances, Sub-Zero built in fridge, Sub-Zero wine fridge and walk in pantry. Additional upgrades include: custom built ins in the library/loft, custom wall paneling in grand living room/master, wrought iron staircase, custom closets, epoxy flooring in garage, along with a covered California room in rear perfect for entertaining. Low maintenance backyard with slate tiles and lush plants make this professionally landscaped yard fit for relaxation. 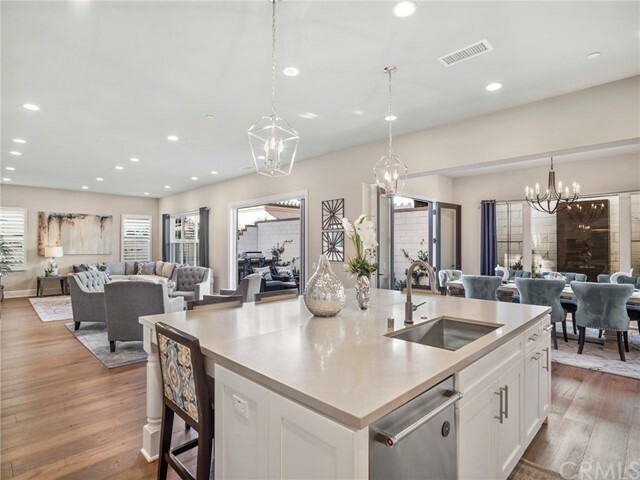 Home is steps away from resort style amenities featuring multiple pools, clubhouses, parks, tot lots, picnic areas, sports courts, and gorgeous Jeffrey Open Space Trail, all within the award winning Irvine School District. Check out supplements for video and virtual tour." 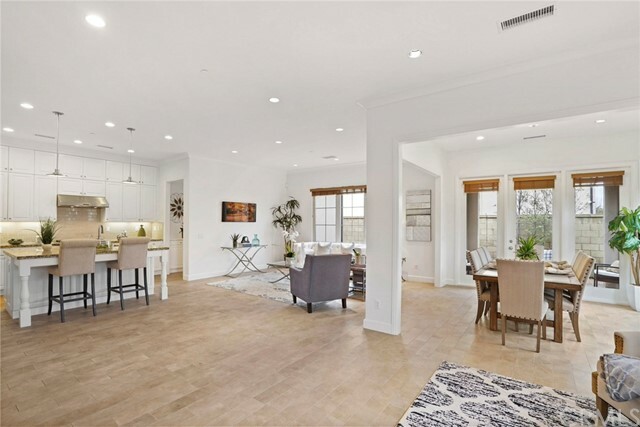 "Highly upgraded and bright END UNITS home in prestigious Northwood Point GATED community, this remodeled 5 bedrooms, 5 full bathrooms + 2 offices residence offers elegance and sophistication. 2 story Vaulted ceiling, custom iron wrought staircase and custom built-ins throughout the house give it a grand & dramatic personality. The formal dining room complete with a built-in china cabinet, the remodeled gourmet kitchen with newer granite counter tops, newer cabinets with rolling out drawers and newer appliances. Family room with fireplace, build in Entertainment/Media Center, Pre-wired Surround Sound. Huge bright Master bedroom with 2 walk in closets, master bathroom with Jacuzzi bath tub. Central vacuum." "GORGEOUS HIGHLY UPGRADED 5-BEDROOM LENNAR EVERYTHING INCLUDED BUILT HOUSE ON THE END OF A QUIET INTERIOR CUL-DE-SAC! 4+ BATHS, SPACIOUS OPEN FLOOR PLAN, ALARM SYSTEM AND HOLIDAY LIGHTING OUTLETS, HOT WATER CIRCULATION FOR INSTANT HOT WATER, GE MONOGRAM STAINLESS APPLIANCES & IT IS PRE-WIRED FOR SOUND. LARGE, MATURE LANDSCAPED LOT WITH A PATIO AND BUILT-IN BACKYARD GAS BBQ, FOUNTAINS AND SPACIOUS SIDE YARDS FOR FLOWERS & VEGETABLES. GARAGE FOR 3 CARS, OR 2 CARS AND ROOM FOR KIDS BIKES & WORKSHOP!NEW PAINT AND CARPET THROUGHOUT. DOWNSTAIRS BEDROOM WITH FULL BATH PLUS A HALF BATH OFF THE FOYER. TRAVERTINE FLOORS THROUGHOUT WITH CARPET IN ALL BEDROOMS. SEPARATE LIVING ROOM, DINING ROOM AND SPACIOUS FAMILY ROOM. GRANITE COUNTERS & ISLAND HAS A WINE COOLER. THE DOUBLE GLASS DOORS OPEN TO A LARGE BACKYARD!MASTER PLANNED COMMUNITY OFFERS AWARD WINNING CLUBHOUSE, 5 SWIMMING POOLS, HOT TUB, BASKETBALL & SAND VOLLEYBALL COURTS.ON THE CORNER -- WITHIN MINUTES WALK -- ONE OF THE FIVE COMMUNITY MAINTAINED SWIMMING POOLS, BASKETBALL AND BBQ GRILLS! WE PLAY & THEY CLEAN UP! WALK TO WOODBURY COMMUNITY PARK & THE JEFFREY OPEN SPACE TRAIL, WITH BIKE LANES AND FLAT TERRAIN. 3 MILES FROM THE IRVINE GREAT PARK. EASY HOME TO FALL IN LOVE WITH!" 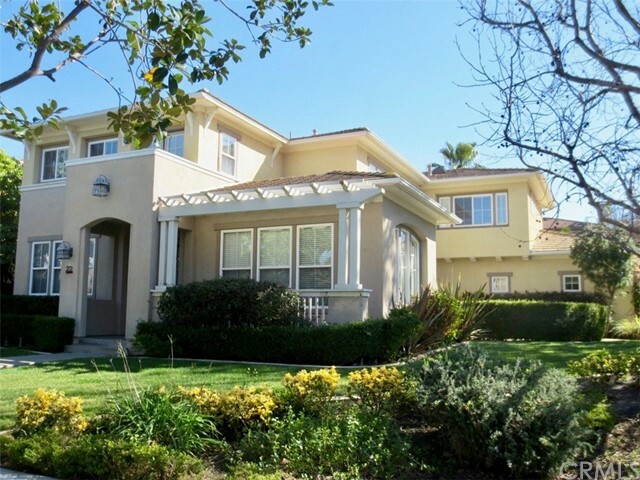 "This highly upgraded home with 5 large bedroom PLUS a bonus room in Northwood Gated Community. Ideal location with south facing direction. From inviting entry with hardwood floors to professional designed backyard making this residence one of the most incomparable, desirable home, kitchen with antique painted cabinets, center island, granite counters, walk-in pantry & beverage center. Kitchen opens to the family room with built-in TV center & fireplace. The downstairs bedroom has separate, private entrance and full bathroom makes a perfect guest room or home office. French door leads to the bonus room with built-in surround sound speakers. Elegant formal dining & living room with fireplace. Master suite with mountain view, master bath features a large soaking tub, and built-in closets, custom tile & Venetian plaster walls. Master bedroom and 3 spacious bedrooms are upstairs, including large secondary bedroom with walk-in closets and private bathroom and private covered balcony. Beautiful backyard is great for entertaining and plenty of grass play space. Crown molding and plantation shutters throughout. Unique stone entry with custom wrought iron gate and covered sitting area. Resort like association amenities including park, pool, spa, and club house. Minutes to award winning Northwood schools and shopping centers. LOW HOA, LOW MELLO ROOS, and LOW TAX RATE !!!" "You must go to 1TwinBranch and take a tour! 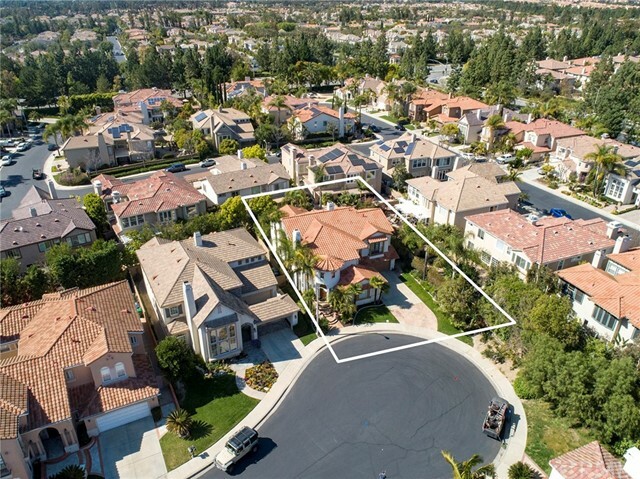 1TwinBranch is located in the 24-hour guard gated community of Trailwood in NorthwoodPointeIrvine and boasts one of the best floor plans and locations in the entire community. Sitting at the end of a quiet private cul de sac, 1TwinBranch also features one of the most functional and valuable floor plans ever designed. The turret style entrance with cathedral high ceilings, combined with the spiral staircase, offers guests a feeling of grandeur and elegance. The kitchen opens to an expansive family room with great views of the backyard waterfall spa and palm trees. The formal dining and living room are combined to show off an entertainers entry area with plenty of room for a piano and extra space for guests. The upstairs features a children's wing with 3 bedrooms and Jack/Jill bathroom separated by an office and leading to the master suite. The master suite features a retreat area and a spacious yet comfortable bathroom area with large walk-in closets. 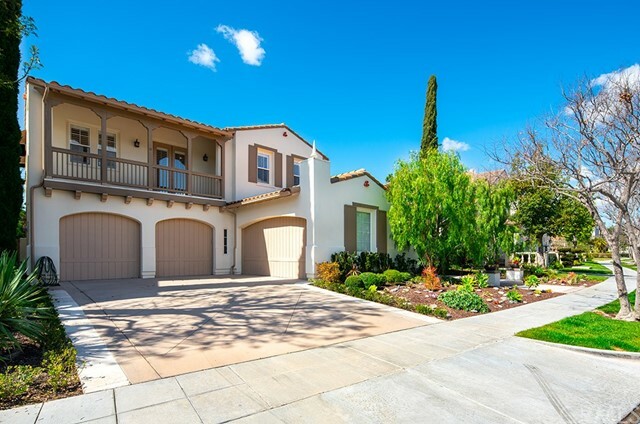 With an extra long driveway and 3 car garage, split between a 2 car and a single car, this Mediterranean style home offers options for extra storage or a casita office or a 6th extra bedroom. The floor plan itself consists of 5 bedrooms (one guest suite downstairs), plus an office, 3.5 bathrooms in almost 3,500 square feet on an almost 7,200 square feet lot. Please see attached for a detailed list of upgrades. Also MR tax due to expire 2020." "105 Paxton will be ready for move-in this summer June 2019. 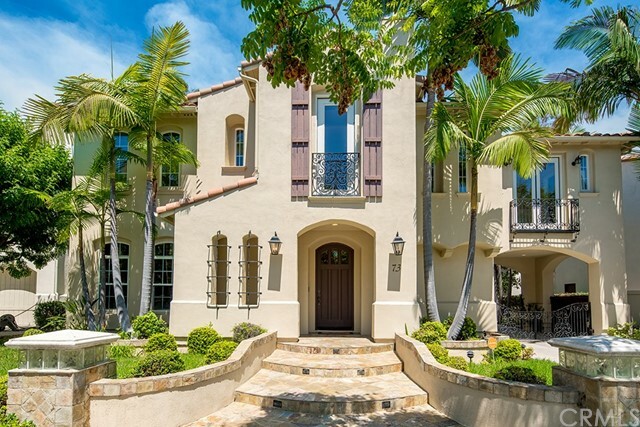 This home will have the desirable Santa Barbara exterior. Located on a cul-de-sac with access to one of many Eastwood Villages walking trails. This beautiful plan 1 includes many upgraded options, sub-zero refrigerator, quartz countertops, two-tone paint, security system and designer custom flooring. This is a must see location. Morro by The New Home Company will offer the very best in Irvine living. Situated within the popular master planned community of Eastwood Village, residents will enjoy any abundance of outdoor amenities and family recreation including several parks, green spaces, pools, paseos and pathways that encourage healthy living and outdoor fun." "Get ready to Fall in Love with this Gorgeous home located in the Prestigious Somerton Gated Community in Northwood Pointe. This Beautiful home features; 5 Bedrooms plus LOFT and 3.5 Baths ( 1 Bedroom & 1.5 Baths located downstairs). Beautiful Travertine/Granite combined floor with medallion accent, Elegant two story high ceiling Living Room and Formal Dining Room with French door. , Great Open floor plan Kitchen with oversized island leading to Breakfast nook and Family Room with custom stone accents surrounding Fireplace and built-in entertainment center. Tastefully Decorated with great wall color and customs crown molding , Recessed lighting throughout , Newer light Fixtures, Newer Sheer Shade window coverings in Master suite, Family Room, Kitchen and Main floor bedroom. Upgraded bathrooms with travertine tiles. Spacious Master suite with his/her walk in closets. Upgraded Master Bathroom. Beautiful Custom Designed Landscaping, Built-in BBQ, 3 Car Tandem Garage. Great amenities including Private access Trails, Tennis Courts, Pools and Park. Low MELLO-ROOS & Low HOA Dues. Award winning Schools." 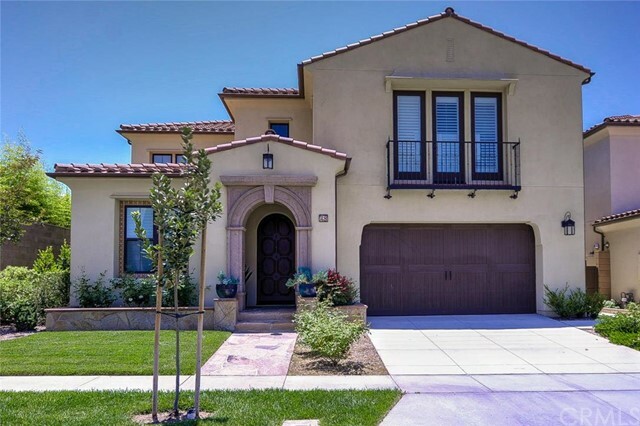 "This highly upgraded formal model luxury home, located in the exclusive gated Somerton community in Northwood Pointe, boasts over 3700+ square feet with five/ six bedrooms with great big backyard. The exterior is freshly painted with custom paint palette. Professionally designed front yard with lush softscape displays great curb appeal. The elegant living room with two story high ceiling, the formal dining room with French doors that leads to the exterior, the library/office with high ceiling and wall to wall built in book shelves are highlighted features that create a great impression. Custom stone floor, wood flooring, plantation shutters and crown moldings adorns the entire home. The gourmet chef's kitchen with extra large center island, opens to the breakfast area and spacious family room with custom wall organizer and cozy fireplace, provides the space for family gathering and intimate enjoyment. There is a bedroom, a full bathroom and laundry room on the first level. The library/office with an en-suite half bath could be a second bedroom on the first level. On the second level, an extra cozy loft space is great for use as a den. Extra large master bedroom with view and lavish master bathroom, walk-in shower, large soaking tub and dual master walk-in closet efforts luxurious quarter for retreat. Three additional bedroom and bathroom complete the second level. This home is close to two parks and renowned Irvine schools. Low association dues and low Mello-Roos!" "This elegant single-family home was built in 2017, situated in Eastwood Village. Walking distance to Eastwood Elementary School and Eastwood Neighborhood Park. Highly-ranked Northwood High School is just about 2.2 miles away! It has 4 bedrooms and 4.5 baths. The downstairs junior master bedroom has its own full bath and walk-in closet. Its spacious gourmet kitchen has stainless steel home appliances include a built-in French door refrigerator, microwave, convection oven, cooktop, energy star dishwasher, etc. An extended dining area and a walk-in pantry/storage room are next to kitchen. There is big loft on second floor. The upstairs master bedroom is impressive with DUAL walk-in closets! This home also has upgraded shutter and curtain, elegant wood floors on both first and second floors (tile floors in kitchen, dining, baths, and laundry room, etc), and front-and-back landscaping. Private community amenities include Jr. Olympic pool, club-room, spa, tot lot, baseball field, family-friendly parks with BBQ and picnic areas, shade structures, half-court basketball, sand volleyball court, picturesque trails, etc. 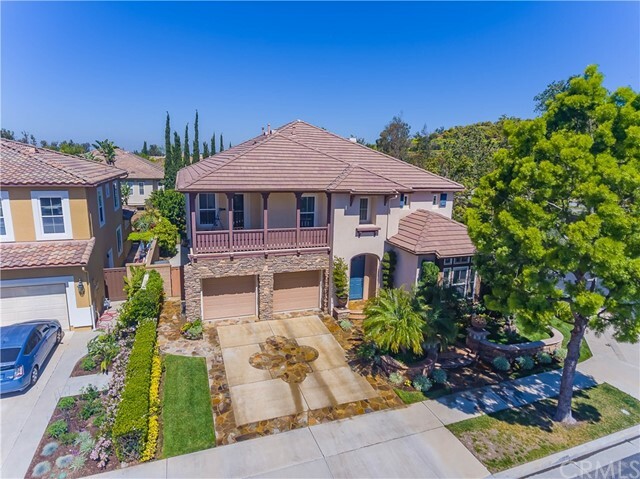 This home is situated in a very good location in Irvine with easy access to major freeways such as I-5, 133, 241, and 261." "Move in ready newly built home. Morro's plan 1 with Santa Barbara Exterior features upstairs bonus room, spacious bedrooms including a down stairs guest bedroom. Located on a cul-de-sac street with access to one of many Eastwood Villages walking trails. This is a must see location. Beautiful designer interior upgrades. Morro by The New Home Company will offer the very best in Irvine living. Situated within the popular master planned community of Eastwood Village, residents will enjoy any abundance of outdoor amenities and family recreation including several parks, green spaces, pools, paseos and pathways that encourage healthy living and outdoor fun." "**NICE AREA! GOOD LOCATION! SUPER CLEAN & MOVE-IN CONDITION. 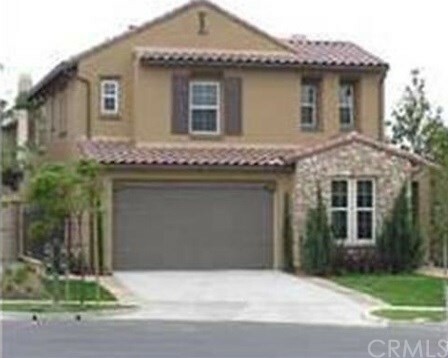 ** BEAUTIFUL HOUSE** IN THE 24 HOURS GUARD GATED NORTHWOOD POINTE COMMUNITY. AWARDED 10/10 CANYON VIEW ELEMENTARY SCHOOL & NORTHWOOD HIGH SCHOOL. FULLY ENJOY THE AMAZING HOA FACILITIES & AMENITIES WHICH INCLUDE 2 SWIMMING CENTERS/POOLS, TENNIS COURT, SAND VOLLEYBALL, BASKETBALL COURT, BASEBALL & SOCCER, TAI CHI PAVILLION + PRIVATE PARK + CHILDREN'S PLAY AREA etc., GORGEOUS CORNER LOT WITH A VERY BIG SIDE YARD + 3 CAR GARAGE AND EXCELLENT DRIVE WAY! 4 SUITES PLUS A HUGE LOFT UPSTAIRS. CUSTOM WOOD & MARBLE FLOORING THROUGHT OUT THE 1ST FLOOR! 1 BEDROOM AND 1 BATH + 1 POWDER ROOM DOWNSTAIRS. UPGRADED KITCHEN WITH GRANITE COUNTER TOPS AND BUILT-IN APPLIANCES. WONDERFUL LIVING ROOM AND FAMILY ROOM! VERY SPACIOUS MASTER SUITE WITH WALK-IN CLOSET/ BATH TUB/ SHOWER & HIS & HER'S DOUBLE SINK. CLOSE TO SHOPPING CENTER, RESTAURANTS & FREEWAYS. ALL YOU NEED TO DO IS MOVE-IN AND ENJOY IT!" "Fabulous 5 Bedroom, 4 Bath home in the resort style Village of Woodbury. Main level includes a custom library, large dining room and a highly desirable main floor bedroom. The gourmet kitchen comes complete with granite countertops, custom tile backsplash, double oven, built-in refrigerator opens to the family room to create a great gathering space. Upper level features two rooms with a Jack and Jill bathroom, third bedroom with ensuite bathroom and the master bedroom. Master bath includes extensive stone and tile work, a large Jetted Soaking Tub, dual sinks, glass shower and walk in closet. Back yard with Built in BBQ, a Jetted Spa with 3 fountains and the Serene side Courtyard, this home is an entertainers Dream. Many features including Travertine walkways from the curb and continues into the lower level, unique fireplace in the family room, French Mullioned Windows, Plantation Shutters and Crown Molding are used throughout this extensively upgraded home. Fresh new paint throughout most of the interior. Located within close walking distance to award winning Woodbury Elementary School, Jeffrey Trail Middle School, as well as many great parks, pools, tot lots & trails. This home is a must see!" "HUGE LOT!! 11.250 Square Foot lot - (per Assessor) Seller paid an additional 70K for the large corner lot in addition to over 80K in upgrades. Granite Counters and back splash, alarm / automation, Ceramic tile, Custom Marble / tile counters in the master bath. Two tone paint, upgraded cabinets and appliances. Over $125K in landscaping and Koi Pond. Located in Northwood Point - private gated community with 24 hour guard within the Mayfield neighborhood. ALL 4 bedrooms have a private bath - Large bedroom downstairs - Plus Bonus area, Separate dining and living room for large gatherings. All built in appliances and built in furniture is staying. End of cul-de-sac location next to trail for privacy. Lovely bridge covered pond with a waterfall feature. 3 car garage with a large carport - perfect for approximately 4 extra vehicles or RV parking all inside an electric gate. Walking distance to Northwood high school, Canyon View Elementary and Sierra Vista Middle School. HOA offers pools and spaand tennis . 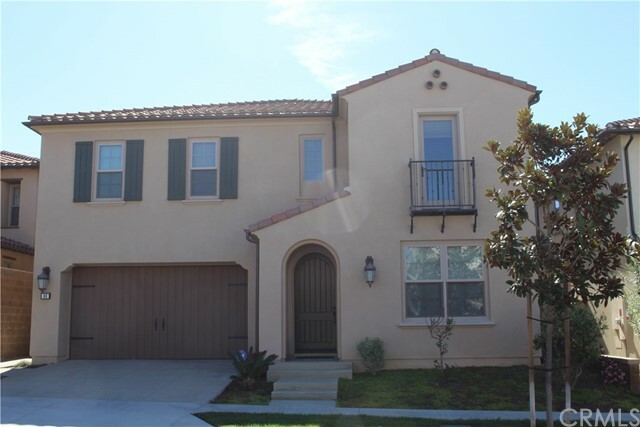 Buyer incentive of $12,500 with a close of escrow date on or before 5/31/2019." "Beautifully upgraded inside and out, this Stonegate Village home was built to satisfy picky home buyers. Featuring 4 bedrooms, 4.5 bath, exclusive cooled winery room and a 2 car garage. SPACIOUS OPEN FLOOR PLAN and gourmet kitchen are welcoming and ideal for entertaining. Classy cabinetry, large center island, commercial style 48 6-burner cooktop, built-in Kitchen Aid refrigerator are chefs' dream. Granite floor throughout; custom-made wood shutter window treatments in the entire house; folding patio doors open up the dining room and extend the living space to the cozy backyard. Both the front entry and the garden were professionally landscaped. Other features include upgraded bathrooms, solar panels. ALL BEDROOMS HAVE AN ENSUITE BATHROOM. Main floor bedroom is commodious for overnight guests or in-laws. Master bedroom, two secondary bedrooms, and a loft are on the upper level. Prime location, walking distance to Jeffrey Open Space Trail. Stonegate Village offers resort-style amenities including, 4 swimming pools, 4 tennis courts, 7 parks, soccer field, basketball court, BBQ, picnic areas. IT'S A MUST SEE YOU WILL LOVE IT!!" "Located in the vibrant community of Cypress Village, this astonishing Mulberry Plan 2 is an unbelievable find. Architecturally designed with a popular open floor plan, spacious living quarters, and an elegant natural stone wall exterior. Home has desirable downstairs bedroom with full bath and expansive conservatory room. A chef s dream kitchen surrounded by KitchenAid stainless steel appliances, large walk-in pantry, sizeable island, and granite countertops with full upgraded tile backsplash. Grand master bedroom has huge walk-in closet, coffered ceiling with crystal chandelier, and double French door to Juliet balcony. Master bath features dual sink vanities and natural stone tiles highlighted throughout. Other generous upgrades include designer paint, plush carpet, rich porcelain tile floors, and epoxy flooring in garage. Enjoy a professionally landscaped yard accentuated by decorative pavers and a bonus California room with built in ceiling fan. 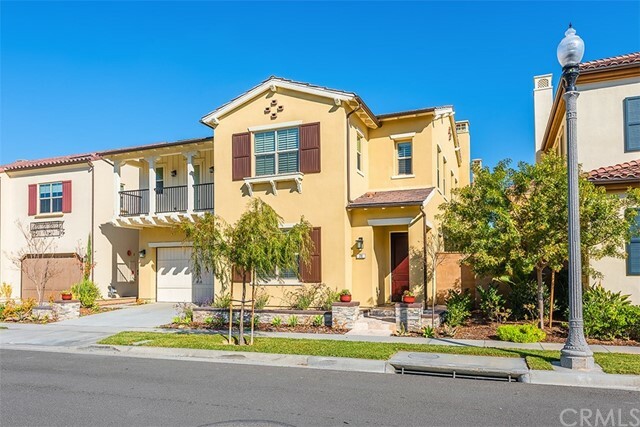 Walking distance to numerous resort style amenities like pools, parks, trails, and award winning Irvine Unified Schools."